Now in its second year, this new conference will focus on problems and vulnerabilities, and in particular, on developments aiming to improve the accuracy and reliability of the various GNSSes. Issues to be discussed include: core system developments and vulnerabilities, augmentation systems, space weather and ionospheric effects on positioning, tropospheric effects on positioning, multipath mitigation, navigation algorithms, receiver and antenna design, system integration, application-related end user experience. The deadline for extended abstracts (300-500 words) is March 15, 2008. Please submit them to Dr. Renat0 Filjar, FRIN (email address below). The event is sponored by the Royal Institute of Navigation (RIN), London, UK and its new Croatian Branch, as well as the University of Nottingham, UK. 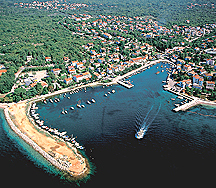 The resort area of Baška, on the Adriatic island of Krk, may be reached via regular EasyJet London Luton – Rijeka/Krk Airport flights, and seasonal flights to Rijeka/Krk Airport from various airports in Western and Central Europe. It is only a couple of hours drive from surrounding countries.